Video projectors are great. They can easily produce a very large image to watch. With that large image comes a large screen, and who wants to look at a large screen when not watching TV? Well, [Steve] didn’t either so he set out to make a powered retractable screen for his projector. The best part about this one is that it is done in true DIY/hacker fashion. The parts used are definitely not intended to be used as anything close to a projector screen and the overall cost is kept to an absolute minimum. 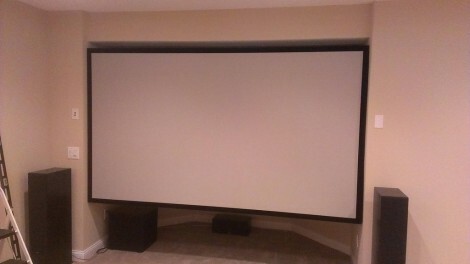 This huge projection screen fills an odd alcove in [Dodge Boy’s] screening room. He built it himself for under $200. The materials, tools, and techniques make this a possibility for anyone who wants their own projection setup. The frame is made of pine 1×3 dimensional lumber. To keep the fabric from touching the supports in the center of the frame he added quarter-round trim to around the perimeter. From there he painted it black and went for a test-fit. The bad news is that the drywall is neither perfectly flat, nor parallel/square. He ended up taking the trim off and ripping down one side of the frame. That did the trick and he went on to stretch spandex over the whole thing. The frame hangs from a french cleat on either side of the opening. From what we can tell, the surface is just fabric and not painted as we usually see with these setups. [Dodge Boy’s] utility room shares the back wall of the screening room. That’s where he stores the HTPC which feeds he project, with an RF remote to control it through the wall.